These Cupcake cards look delicious and there's not a calorie in sight ... so no need to worry about your weight. This design is very trendy at the moment and they are appearing on lots of things, from cards, scrapbook layouts, to fabrics and wallpapers. The cards are very easy to make and they can be any size of cake that you wish. 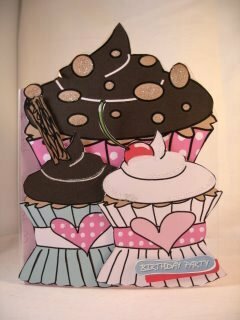 You can buy the cupcakes image in digital format, as a stamped image or ready to make card kits. So whichever way you like to make your cards there is something for every style. Add some glitter and sparkle with any of your Embellishments. 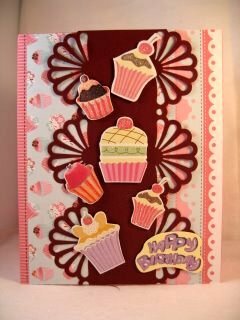 This card features three cupcakes that I have added at different levels using foam pads, and they appear to be free standing as they are layered onto Acetate. Cupcakes are really big business for the baker too, as it is very fashionable to have your wedding cake made from these tasty little treats. They are added to a tall tier and they look delicious. 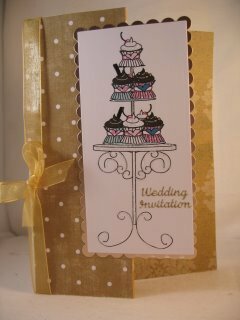 This card features cakes on a stand and it is decorated with gold ribbon and glamour dust. They can be decorated any way you wish. Try adding tiny flowers, gemstones or little bows to them for a real change. And if you wanted to have a try at making the real thing for your self then visit Cupcakes plain and fancy for some mouthwatering ideas, hints and tips on how to make the most wonderful cakes for yourself or your friends. You can even buy little cupcake makers for just a few pounds. Get the kids involved and then enjoy your treat. These little cakes are ideal for an invitation to a childs birthday party, or an invitation to afternoon tea with your friends. They are added to the base card with foam pads, and sparkled up with Glamour Dust. The "Birthday" sentiment is a chipboard tag. All very delicious and completely non-fattening!! There are many ways to create these cards and just as many ways to decorate them. The vintage look would add lace and roses to the design and keep the colors soft and muted. Then on the other hand you could make them as wild as you wished with vibrant colours and patterns on each individual cake. Select your theme and the occasion you are making the card for and then let your imagination go as you think of ways to add interest to your design.